Join the live blog: How long can Obama delay? Syria has reportedly accepted a Russian proposal to hand over its chemical weapons to international control, but the details of what was actually agreed upon are still murky. Later tonight, Secretary of State John Kerry heads to Russia for talks on making that deal happen. U.S. 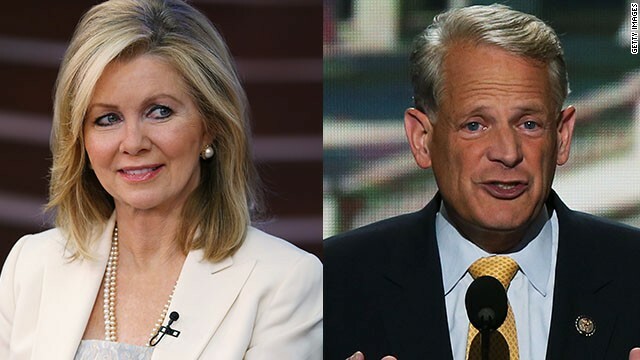 Representatives Steve Israel (D-NY) and Marsha Blackburn (R-TN) join hosts Newt Gingrich and Stephanie Cutter in the Crossfire tonight to debate how long the U.S. should wait for Syria to act on this offer. We want you to weigh in: Should Congress force a deadline for Syria to turn over its chemical weapons? Vote below or tweet your response using #CrossfireReturns. You can also vote by commenting on our Facebook post. During the show, join the conversation with #CrossfireReturns on Twitter and Facebook or participate and follow along with our live blog at crossfirelive.cnn.com. Right wing radicals should read about the Cuban Missile Crisis of 1962, which JFK resolved in the same manner that the sitting president is using to resolve the Syrian poison gas problem. What Kennedy did was to order a massive show of force at Cuba, in which almost every Naval ship in the Atlantic was sent to Cuba, followed immediately by a flyover of approximately 1,000 military aircraft. I know because, as a Naval Aviator, I flew one of those planes. Kennedy followed this show of force with meetings with Nikita Kruschev and shortly thereafter, Kruschev arranged for the return of the missiles to Russia. President Obama is following JFK's playbook, and Putin has blinked. As in 1962, the potential threat of military action by the US should not be eased until the poison gas is out of Syria and in Russia. There is a ton of details that needs to be worked out between the US and Russia, but they are a lot easier than dealing with the issues a limited strike would cause. Not sure that Russia should be the country to control the chemical weapons. We gambled on a WWIII to get those missiles out of Cuba. Do you think this president is willing to go that far in Syria? So far U.S. threats don't come anywhere near that level of response to backup the crossing of a red line. If by some miracle the diplomatic efforts pan out, Assad has still gotten away with using chemical weapons and hasn't really given anything up that will make a difference in the outcome of the Syrian war. @Steve,most certainly right and these ignorents don't understand what pressure this country can exert on other countrys..Pres.Obama said no boots and he means it and guess what republicans he got Russia,China off their asses didn't he in being involved without any military action..Bet Bushs,Gingrich would have been frothing at the mouth wanting to push a button wouldn't they ..Your Bushs put wars nasty taste in our citizens mouths and if you remember it was suppidly going to be a short term military conflict and look what that moron from Texas got us into!! If we fire on Syria HOW DO WE AVOID HITTING A STOCK PILE OF GAS? @Leo,ever hear of satellite tracking for missile guidence systems..Navy has the most advanced tracking systems and even Russia and their navy doesn't want to screw with us,their navy is strictly show! !